I have a serious phobia about trying new things at restaurants. Don’t get me wrong, I absolutely love checking out new restaurants and have no problem ordering whatever sounds good to me, but when it comes to ordering something different than what I got the first time I was there, I’m a total wimp. When I already know that something is good, why would I take a risk and order something different? What if it doesn’t taste good and I just waste a bunch of money? The absolute worst case of order-changing-phobia I’ve ever had was at this little Thai place in the town where I went to college. The first time I tried Thai food I ordered chicken with cashew nuts, and it has been my absolute favorite dish in the WORLD ever since. In all seriousness, it took me YEARS to order something different. I finally got tipsy brave one night at dinner and decided to order something different. 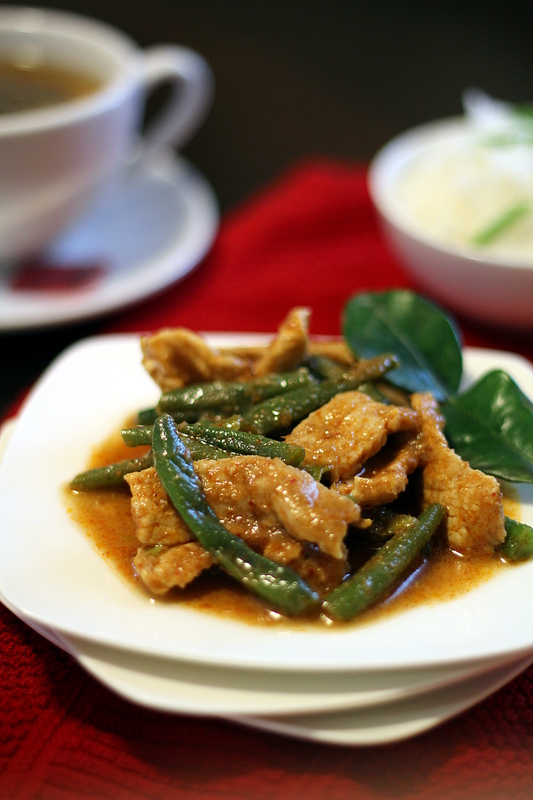 I went with pad prik king, also known as chicken with spicy green beans, and it was divine. Prik king itself is actually a type of curry , like panang or massaman. In Thailand the husband and I saw prik king used “dry” (meaning without coconut milk) to saute meat and vegetables. 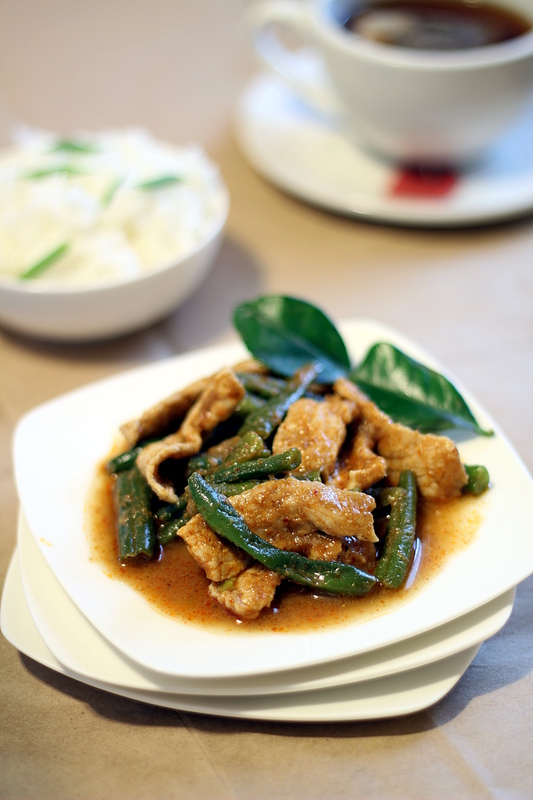 While chicken and green beans is the most common combination seen here in the states, moo paht prik king, or pork with spicy green beans, is a delicious alternative. An absolute cinch to make, this dish comes together in under 15 minutes so be sure to start your rice ahead of time! Side note: I recently found myself on the rice aisle at the local Asian supermarket deciding between a ten or twenty-five pound bag of jasmine rice. I think I have a problem. 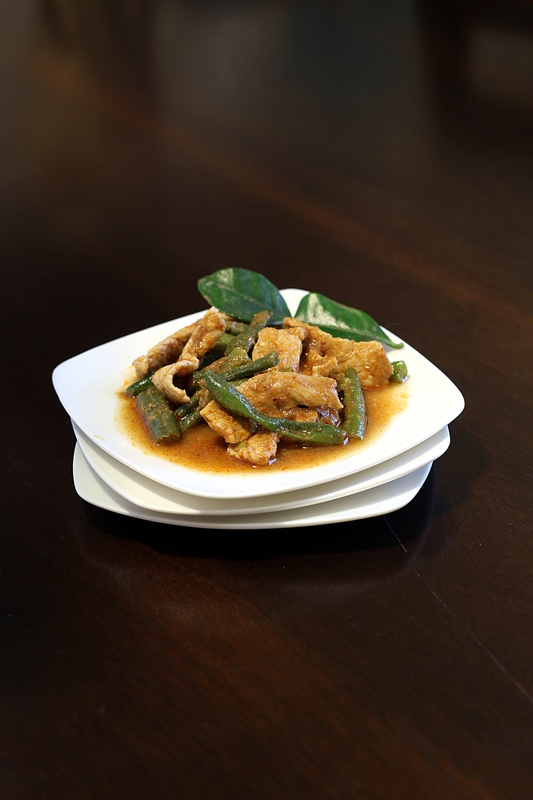 Okay, back to the pork: Do you see that delicious sauce nestled underneath the green beans and pork? It is just begging to be soaked up by some rice. Never skimp on the rice. You don’t need any special equipment or ingredients to make this incredibly easy dish at home. I’ve included the traditional elements below, but I’ve also added notes about simple substitutions you can make if you don’t have a particular ingredient on hand. Bring a pot of water to a boil and toss in your green beans. Let cook for about 3 minutes, then strain and rinse with cold water. Heat the sesame and grapeseed oil over medium-low in a large skillet. Add in the curry paste and stir for 2-3 minutes until the paste is well combined with the oil. Use the back of a wooden spoon to work the two together. Turn the heat up to medium-high and add the pork strips. Stir the pork around to evenly coat in curry paste for a minute or two, then add in the broth, fish sauce, wild lime leaves (if using), and palm sugar. Stir well to combine. Add the green beans to the pan and saute for another 3 minutes. Serve with lots of jasmine rice! *The lime leaves are pictured as a garnish, in case you are wondering what they look like. What are your favorite Thai dishes? I’d love a challenge!